The Toronto condo bubble is as real as an investor running a negative monthly cash flow on his new 1-bedroom downtown apartment. 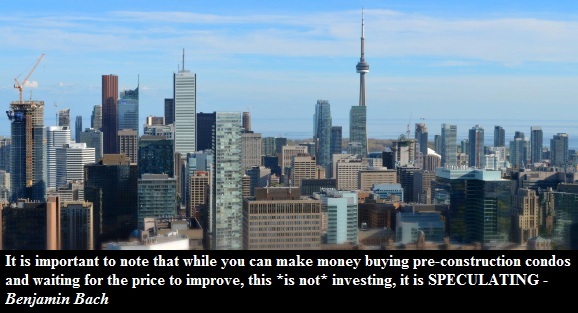 Scotiabank estimates that between 45%-60% of all new condo sales in Toronto went to investors/speculators over the past few years. Immediately a question pops up in my head: if condo living is the way of the future, then why is it that the majority of people who buy condos never actually live in them? According to the bank, the average down payment is typically between 5%-15% with leveraged equity being the main source for the down payment. No wonder household debt has reached 165% of income as hairdressers started pulling money out of their homes to subsidize hippie renters downtown. Buy it, rent it, flip it. Oh, and don't forget to throw a couple of hundred bucks each month into your new condo as a part of your carrying cost. The graph below assumes a 20% down payment so the reality is much worse.